Lawsuit claims Musk wanted to harm short sellers. Tesla (TSLA - Get Report) and CEO Elon Musk were sued in Federal court in San Francisco Friday over Musk's tweets earlier in the week saying he was considering taking the electric vehicle maker private at $420 a share, according to a published report. Musk and the company are accused of launching a "nuclear attack" on short-sellers, Reuters reported. The suit is seeking certification as a class action. Shares of Tesla, among the most heavily shorted stocks on Wall Street, surged Tuesday after Musk tweeted that he had secured financing to go private at $420 a share. 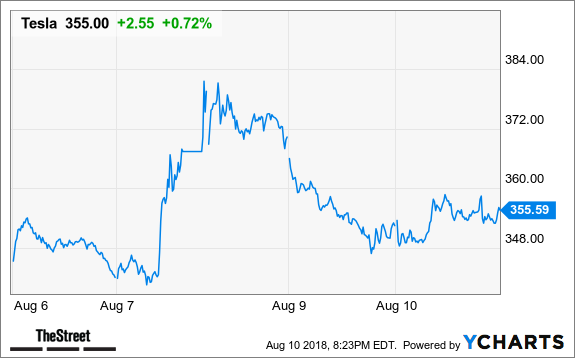 The stock gave up most of those gains over the next two days, as doubts arose about whether Musk had found the backing and whether the company's board had been informed of the plan ahead of time. The SEC is reportedly investigating Musk's actions. The company's board is reportedly set to meet next week with bankers, and is asking Musk to recuse himself from the discussions. Shares of Tesla ended Friday up $3.04 at $355.49. Satellite radio provider SiriusXM reports first-quarter earnings that miss analysts' forecasts amid costs related to its acquisition of streaming music service Pandora.